Our Price: $3.95 plus State of Maine Sales Tax of $.22 = $4.17. 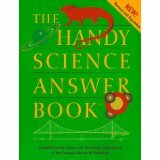 This entry was posted in Books & Literature - All On This Site, Books - Reference, Books - Sciences and tagged common science questions, handy science answer book, popular science, science, science answers. Bookmark the permalink.